In this article we will show you how to setup HTTP access to your Microsoft SQL Analysis Service which is needed if you intend to use XmlaDataProvider. As a prerequisite you must have installed Microsoft SQL Server and at least one OLAP Cube to be deployed there. 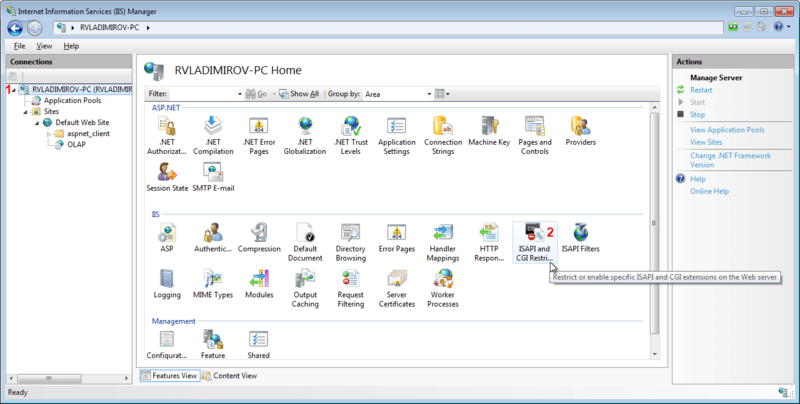 RadPivotGrid sends an HTTP post request to IIS using the IIS servername and path to service component (msmdpump.dll) as url. IIS receives the request, authenticates the sender, and creates a security context in which the pump will be executed. IIS starts pump and uses Internet Server Application Programming Interface (ISAPI) to communicate with pump. The pump connects to Analysis Service via TCP/IP and sends data received from RadPivotGrid without any change. Analysis Service executes the request and sends response to pump which passes response to RadPivotGrid. Open "Control Panel" and select "Programs". In the opened window find the folder Internet Information Services where you can find the features we need. The easiest and most suitable solution is to install everything and this way get things out of trouble, but the only mandatory things are: Web Management Tools, .NET Extensibility, ASP.NET, ISAPI Extensions, Basic Authentication and Windows Authentication. When you click OK, IIS will be installed. 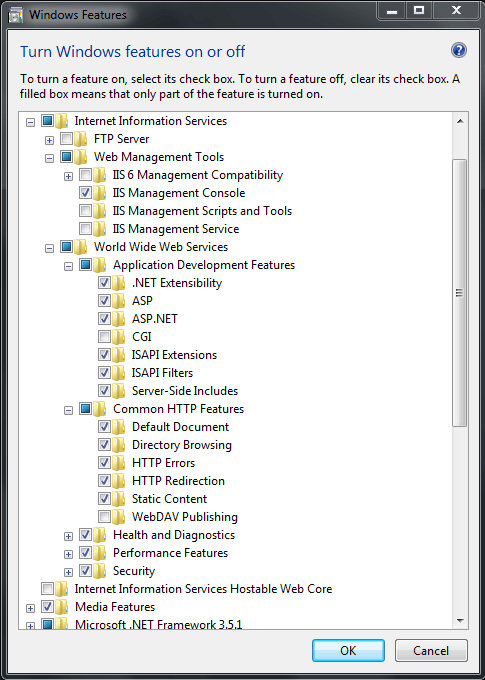 It is time to configure our Internet Information Service (IIS). To do it start Internet Information Services Manager (just write IIS in the Start menu search and you will find it). 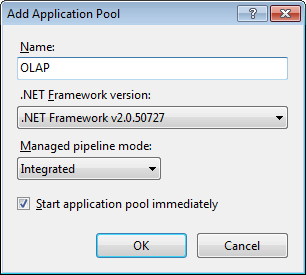 Create folder called OLAP under C:\inetpub\wwwRoot. 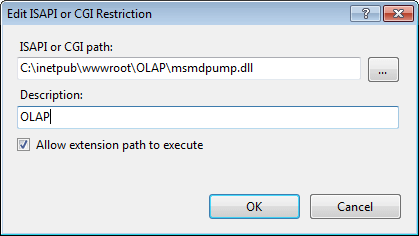 Copy the files msmdpump.dll, msmdpump.ini from "Installation Folder\Microsoft SQL Server\MSAS10_50.MSSQLSERVER\OLAP\bin\isapi to C:\inetpub\wwwRoot\OLAP folder. The path may be slightly different based on the installed version of MS SQL Server. 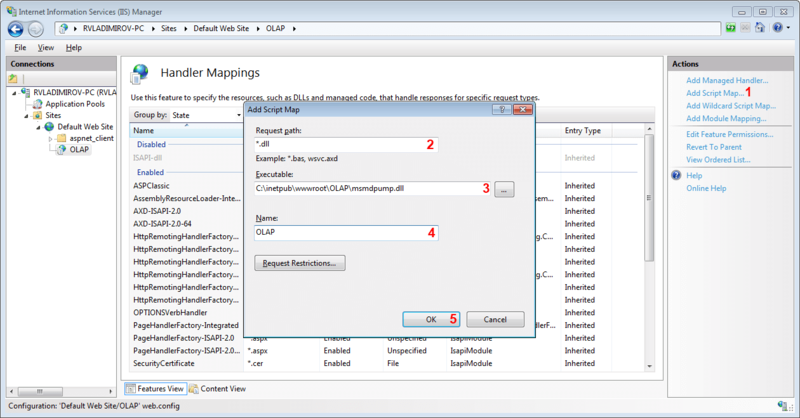 Go to IIS and find OLAP folder under Default Web Site. Right Click on it and choose Convert to Application. Click OK to complete the operation. Go to Handler Mappings option and double-click it (or use the "Open Feature" Action in the top right corner) then select "Edit Feature Permission" and make sure the directoy has "Read" and "Script" permissions. 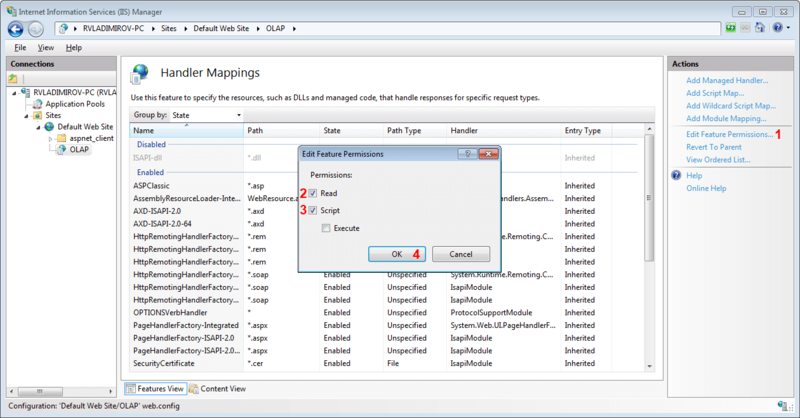 In the top right coner of the "Handler Mappings" screen, click "Add Script Map...". And add following information. When you click OK a warning message will be raised - click yes to confirm that you want to allow ISAPI extension. After that on IIS go to "Application Pool" and select "ISAPI and CGI Restrictions" under security. Change the authentication mode in IIS and give access to other users instead of IUSR - this is okay for your security restrictions, but you have to apply your changes in the Analysis Services as well. Use the default authentication mode - this way IUSR user will be used to connect to Analysis Service. It is mandatory to give this user privileges in the Analysis Service. In the General Tab above you can set database permissions for this role. Your users will need at least Read permissions. After applying this you should be able to use XmlaDataProvider in your RadPivotGrid to access the data from your Cube. To enable a Silverlight control to access a service in another domain, the service must explicitly opt-in to allow cross-domain access. By opting-in, a service states that the operations it exposes can safely be invoked by a Silverlight control, without potentially damaging consequences to the data that the service stores. That's why you have to place a clientaccesspolicy.xml file at the root of the domain where the service is hosted to configure the service to allow cross-domain access. The following configuration allows access from any other domain to all resources on the current domain. If you use Authentication for your service, you should add Authorization in the http-request-headers: http-request-headers="SOAPAction,Authorization". More information about clientaccespolicy can be found here.